Did you miss one of our webinars or presentations? Would you like to listen to our most recent podcast? If so – you can find all of that here! Questions or comments? E-mail Director of Communications and Digital Strategy Dani Carlson. Loren Anthes and Adam White talk about Governor Mike DeWine’s first budget – why everyone should pay attention to it and what it could mean for health and human services in Ohio moving forward. Listen here or download it here! 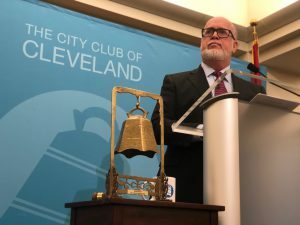 The Center for Community Solutions’ President and Executive Director, John Corlett, kicked off The City Club of Cleveland’s 2019 forums on January 11, 2019. His speech was a part of The City Club’s “Local Heroes” series, and took a look at the State of Ohio’s budget and policies and offered potential solutions. Watch the video of his speech, courtesy of The City Club, below. To obtain a CEU from the National Association of Social Workers, Ohio Chapter, please click here! Video of the September 6, 2018 webinar is below. July 10, 2018, Bridges Across Every Divide, Human Services Advocacy Network Event presentation here! February 22, 2018 – Medicaid Experiments: Ohio’s New Waivers click here or below to watch this webinar. This webinar, presented by Emily Campbell, Senior Fellow / Williamson Family Fellow for Applied Research and the Associate Director of The Center for Community Solutions will introduce participants to the benefit cliff and how it can impact low-income families. New data will be presented which shows where Ohio working families would experience a cliff. We will discuss how policy decisions in recent years have improved or deepened cliffs, and what it might take families to overcome these obstacles. This webinar is eligible for one social work CEU through the National Association of Social Workers, Ohio chapter. Please click below to take a short test.